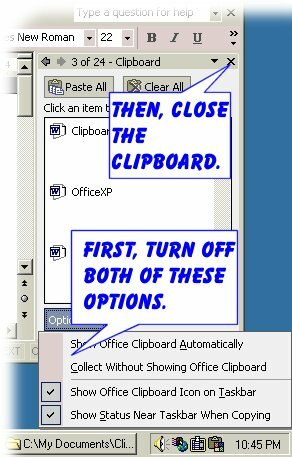 Microsoft Office has a clipboard history window, which can be bothersome, or if you are working with a clipboard extender such as ClipMate, can interfere with normal operation. It’s not always intuitive how to close it, so we’ve collected and summarized information here. Doesn’t seem to be a problem. I haven’t seen a clipboard come up, when performing multiple copies. Just click on either of the above links above, download and run the file to update the registry. You’ll be prompted with an “are you sure” dialog, and then the registry is updated. If you want to see what they’re doing first, just download to your hard disk and open with a text editor such as Notepad. OfficeXP has a clipboard that will interfere with certain ClipMate operations like PowrePaste. Disabling it is easy. Start WinWord, and you’ll see the “task pane” at the side of the screen. Within the task pane, you’ll see the clipboard appear if you copy two items in a row. Now you can turn it off for good. Select the “Options” menu, and turn off the “Show Automatically” and “Collect without showing” options. There is a screenshot to show this. When you re-start WinWord, the clipboard won’t re-appear. If you need to bring it back, you can do so via the menu at the top of the “task pane”. Alternately, if you see the OfficeXP clipboard icon showing in the Windows System Tray (next to the clock), you can right-click on it and select “stop collecting”. Annoyances.Org has a page on disabling the Office Clipboard in both Office2000 and XP. Close all Office applications, including Outlook, before performing any of the following registry edits. Where [version] corresponds to your Office version: 9.0 = Office 2000, 10.0 = Office XP, and 11.0 = Office 2003. 2. Locate the DWORD value AcbControl or create the value if it does not exist. 4. Close the Registry Editor and restart an Office application. Nothing else I did was working. I had clicked off that stupid checkmark next to Automatically Open Clipboard at least a dozen times. I had clicked off every other checkmark I could find. Every time I went into Excel and copied a couple of times the @#*& Clipboard would open up AGAIN. It looks like you’ve found a way to get the job done. I just wish Microsoft Office would have honored my first attempts to turn off the clipboard. It shouldn’t be that hard. Sorry for re-opening this old topic, but is there a registry key I can create/change to just stop the pop-up asking to save the clipboard on exit?